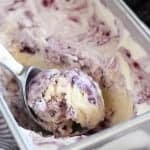 Blackberry Ice Cream – Smooth and creamy no-churn vanilla ice cream swirled with smashed blackberries. No cooking and no ice cream maker needed! No-churn ice cream!!! Have you made it before? This was my first time, and it was a huge success! I never realized how easy it is to make smooth and creamy ice cream at home, with no cooking, and no ice cream maker! 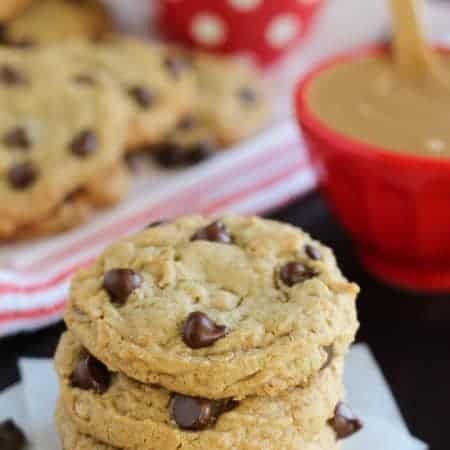 This recipe is the perfect blank canvas for creating any flavor of ice cream, and it is so unbelievably easy -anyone can do this. This recipe only uses 5 ingredients, and the hardest part is waiting for the ice cream to harden in the freezer. Tick, tock, tick, tock… you’ll be anxious. Trust me. 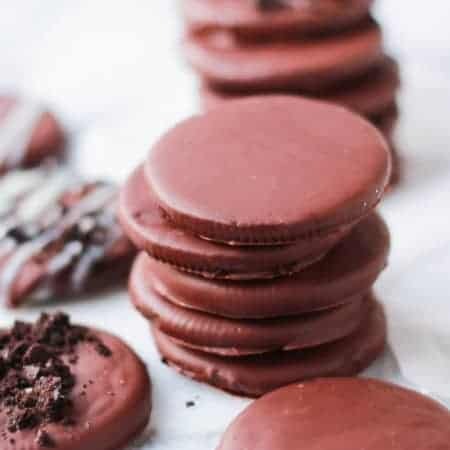 To prepare, whip heavy cream, stir in vanilla extract and sweetened condensed milk, pour it into a freezer safe container (I used a loaf pan), and freeze until firm. That’s it! This basic no-churn vanilla ice cream recipe can be adapted into many different flavor variations. 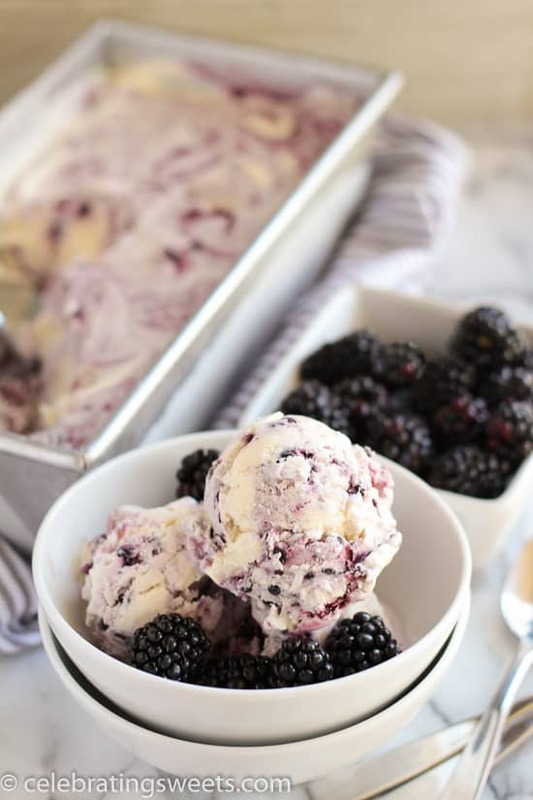 I mashed fresh blackberries with a touch of sugar and swirled them into the vanilla ice cream. The blackberries added a beautiful color and pop of fresh flavor. You can totally swap out the blackberries for a different berry. Raspberries or blueberries would both be great. 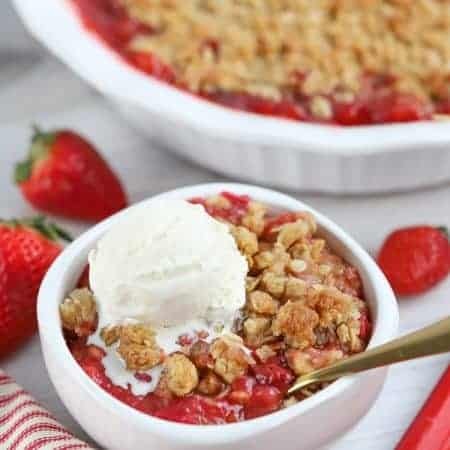 Just adjust the sugar accordingly, raspberries tend to be more tart, so you might need to sweeten them a little more. My husband, kiddos, and I shared a big bowl of this ice cream while playing in our backyard last weekend. Jake and Juliette splashed around the pool, excitedly devouring bite after bite of this creamy ice cream. They literally fought over the final bites. Fortunately for us, it’s summery here for several more months, which means many more batches of no-churn ice cream will be made! 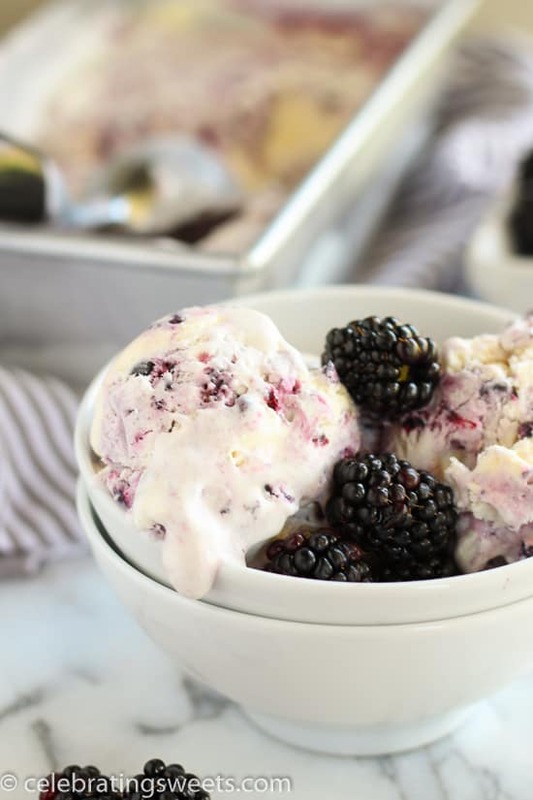 Smooth and creamy no-churn vanilla ice cream swirled with smashed blackberries. No cooking and no ice cream maker needed! In a large bowl, combine sweetened condensed milk and vanilla extract. Set aside. Using a hand mixer or stand mixer, whip the heavy cream until stiff, billowy peaks form. Gently fold half the whipped cream into the condensed milk, then add the other half. In a separate bowl, use a fork or potato masher to mash the blackberries and granulated sugar. Pour half the ice cream base into a 2 quart container (I used a loaf pan). 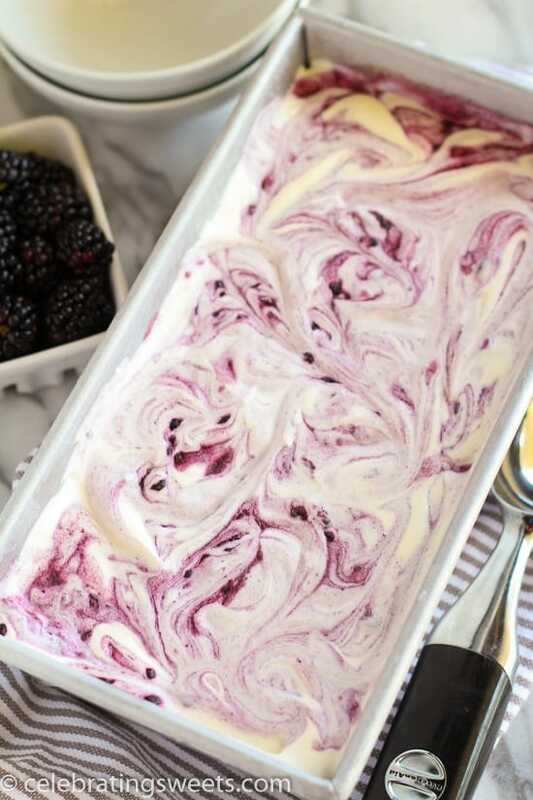 Top with half the smashed blackberries and use a knife to swirl the blackberries into the ice cream. 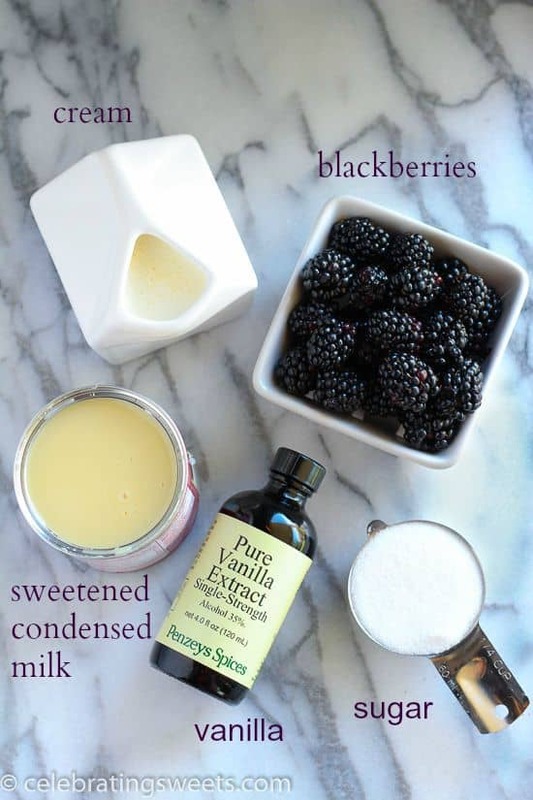 Pour in the remaining half of the ice cream base and top with remaining smashed blackberries. 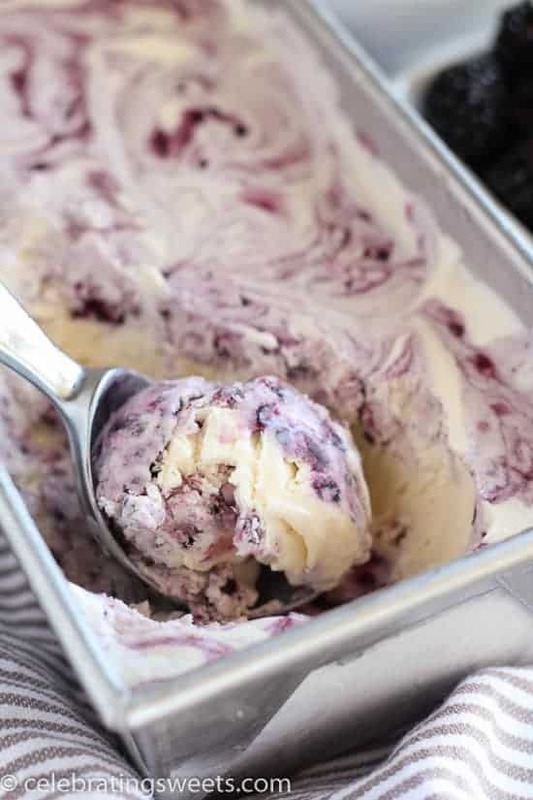 Swirl the remaining blackberries into the ice cream. Cover and freeze until firm, at least 6 hours. I’m so excited to make this ice cream because I’ve never owed an ice cream maker so I skip the ice cream recipes. Yipee, I finally can try an ice cream recipe. Thanks for sharing this tasty summer treat! jam jelly or preserves in place, and how much. Sure, you can use jam, jelly or preserves. The less sweet the better, since the ice cream base is already quite sweet. I would recommend 1/3 cup, or more to taste. Enjoy! Is there any way to get rid of the seeds in the blackberries? My husband likes the seeds. But I don’t. I am learning to like them since we have gotten more this year than last year from our plants. Hi, Marcia. Mash the blackberries with sugar, then press it through a fine mesh sieve. Discard the seeds and swirl the “puree” into the ice cream. You might want to increase the amount of blackberries since you’ll be discarding some of it. Enjoy!